A great looking leather jacket made from soft leather. Designed with distinct buttons that adds a bold style statement. The big brass button top off that classy outfit. 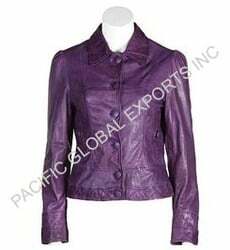 Unbelievable price on Buttoned Womens Leather Jacket in New Delhi (India) company Pacific Global Exports Inc..